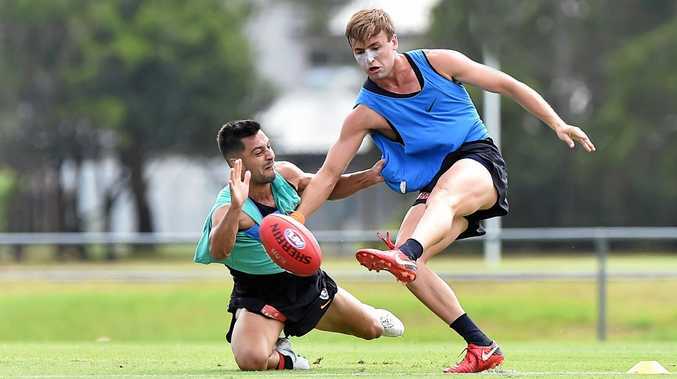 AFL: A fit and firing Carlton squad are optimistic of big improvements in 2019 as they lap up a second consecutive pre-season camp on the Sunshine Coast this week. They endured a dismal two-win campaign which saw them sink to the bottom of the AFL ladder last year, but young gun Lochie O'Brien is confident the Blues' experienced leaders will gel with fresh faces as they propel themselves toward a prime time, season-opening clash with Richmond next month. Speaking after an open training session in front of their Queensland fans at the Maroochydore Multi-Sports Complex, O'Brien said the Coast camp presented an important opportunity for players to develop strong bonds ahead of Round 1. "The boys are really enjoying their time up here, it's a bit of different scenery compared to Melbourne," O'Brien said. "We've done a lot of team-bonding activities, team dinners and things like that, it's an environment where we're put together 24/7 to really improve our bonds and make sure we've got a great synergy heading into the season. "For us younger boys coming off last year, I think it's great for the first years because this is their chance to really buy in to the team and develop good relationships with people who have been here a lot longer. It's also a good chance for them to get their head wrapped around the game plan. "Now being a second-yearer (I'm) a lot more confident when it comes to structure and things like that, we don't have to think about all that stuff too much, we can just get back to playing normal football and all those things we've been training for in the last year is like a habit." The second-year midfielder had plenty of praise for the Blues' new director of high performance Andrew Russell, who was involved with six AFL premiership-winning sides including four at Hawthorn between 2008 and 2015. He said Russell's influence, along with the arrival of highly-touted Number 1 draft pick Sam Walsh, had helped inspire the playing group to aim high for the upcoming season. "Russ' (has) got a lot of experience and the boys are really benefiting from that. He's a really good fella off the field as well ... he's a bit of a larrikin at times which is good because you need a bit of that for off-field balance," O'Brien said. "He's bringing a lot to the group, I think people out here today and supporters can definitely be confident that we're moving pretty well. "Walshy has been labelled as pretty much an AFL footballer coming in (to the team). The way he's been able to come into roles and get in good full sessions already has been really good." O'Brien, who averaged 13.9 disposals across 18 games in his debut season, said he experienced "a few little (injury) issues" toward the end of last year, but should be "all systems go" by the JLT pre-season series starting on February 28. He said two-time Brownlow medallist and former Blues skipper Chris Judd had also been a welcome presence on the camp and thanked the Queensland fans for their support. "It's good talking to 'Juddy' and getting little bits of advice, coming from him I don't think you can get better advice. "It's amazing for the boys to have support all over Australia and I think the way the Queenslanders get around us is second to none ... so a big thank-you to them and we really appreciate the ongoing support."